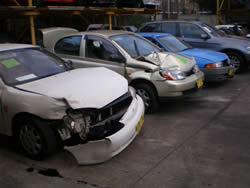 Thousands of vehicles are damaged every day and many are written off, repaired and sold. New cars are often damaged in shipping, showrooms or during test drives. As a matter of fact a dealership sold new cars, months later owners discovered their cars were involved in hail damage. There are many genuine people who sell their cars for the right reasons however there are those who patch up vehicles for easy money.